Step inside and be amazed by an interior full of natural light, stained glass windows and beautiful white tiles. 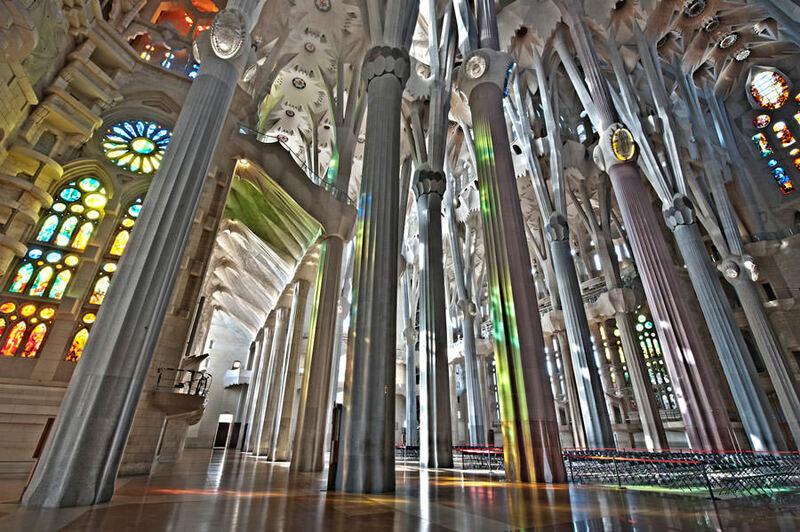 In 1882, construction of Sagrada Família started under architect Francisco de Paula del Villar. In 1883, when Villar resigned, Gaudí took over as chief architect, transforming the project with his architectural and engineering style, combining Gothic and curvilinear Art Nuoveau forms. Gaudí devoted the remainder of his life to the project, and he is buried in the crypt. At the time of his death at age 73 in 1926, when he was run down by a tram, less than a quarter of the project was complete. The central navevaulting was completed in 2000. Chief architect Jordi Fauli announced in October 2015 that construction is 70 percent complete and has entered its final phase of raising six immense steeples. The steeples and most of the church’s structure are to be completed by 2026, the centennial of Gaudí’s death; decorative elements should be complete by 2030 or 2032.